The FS240B is a GSM wireless alarm console, which is for Homes & Businesses with multi-division rooms marketing. The system has completely wireless data communication between wireless sensors and wireless external siren. Two partitions are separated to Arm/Disarm control, for main house and office or garage house, both area are protected. It can be combined with Fronti other accessories like PIR, Door/Window sensor, AC power detector, temperature sensor, wireless siren, AC power switch and ….etc. They are completely wireless communication controlling system. Two partitions of working mode & 70pcs wireless sensors to trigger alarm & 10pcs remote controller. 10 passwords available on PC, SMS and Keypad to set working mode. 70pcs sensors can be set to have alarm function of 24H, bypass, delay, door chime and silent. Touch pad for operating alarm working mode, LCD display for working mode, 150logs alarm event. Set program’s data by keypad, PC and SMS. Set to save local language to the console / event / sensor’s name for the report. Can connect to PC via USB port on window software read/write setting all programs. It can record 40 seconds and 4 kinds of different emergency voice messages by user. Pre-set to save 2 phone numbers for digital dialer CONTACT ID on alarm calling-out. Pre-set to save 4 phone numbers for playing Voice messages on alarm calling-out. Pre-set to save 3 phone numbers for sending event SMS on alarm calling-out. Low battery supervision is on the console and on each individual sensor. Built-in NC/NO 2wires zone input and 2wire alarms output for external siren and NC/NO switch. With 2 channels of temperature sensors which can display INT/EXT -40 to +60℃level data. 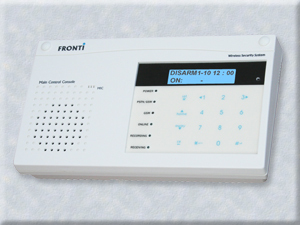 It can control the FS148S wireless external siren and report event to FS310W wireless keypad LCD. User can send SMS to control the AC power switch ON/OFF. Temperature sensors HI/LO level can control the AC power switch ON/OFF. Timers can control the AC power switch ON/OFF. Call-in to remote to activate hands-free speakerphone, 2-way voice communication. After beingconnected to emergency call, the called party can listen-in or talk with. Alarm will call-out to contact ID, and then voice dialer will play voice alarm message. Alarm will send SMS with alarm event, sensor number/name and user name address. Call-in to send SMS command to set working mode and setup alarm program data, it will auto reply SMS to confirm. Can combine with FS330A APP via SMS to setting working/program data and receive alarm event data.